To prevent incidents during working on machine and equipment, needs to installation of machine guards at each rotating parts is basic safety requirements of health and safety system. Machine guarding: The Machine guarding on each machine is basic requirement of the OSHA (Occupational safety and heath administration). Each machine and equipment whereat rotating & transverse part, or wheels is necessary. Keep note that, functions, supporting belts, materials, machine parts or any object may cause serious injury to human body. Hence machine guarding is initial safety requirement and must kept all the time at rotating parts. The safety requirement has no limitation of scope to secure equipment and machinery. More secure environment mean more productivity. You have to prepare documents that helps to defining machine guard. And identification, requirements of training to appropriate user or operators. Implement at all machine, equipment – Where rotating, transverse parts. In the regular tasks at any place of working area needs conduct various processes that machinery and equipment should involved. So its important that any machine part, processes, function that might cause injury must be safeguarded. The machine safe guards are managed as per machine and equipment type. Identified hazards and maintain category of hazards. The hazards must be controlled by any appropriate method. Generally there are some general controls are possible, such as redesign of machine / equipment to isolate hazard. Naturally, Safety team are identify the areas where generally mechanical hazards occurs or possibility of occurrence. the dangerous rotating parts in most area require safe guarding. That are generally in the organization is, the places where work is performed on the material, such as boring, shaping, cutting and shaping works are done. Generally in the manufacturing and engineering units having a wide variety of mechanical motions & actions may present hazards. Generally, Operators and supporting personnel are main sources for identify hazardous movement, objects around the machine. Hence consider those statements and take the help where wide range of multiple type of machinery and equipment installed. Is the basic requirements of safety system that each employee must protect under safety environment. Where the moving movements of machine, rotating parts such as moving melts, meshing gears, rotating cutters are must consider under red category of hazards. Because that can harm human body and with any object serious damage. The safe guarding is prevents contacting hands, arms or any other part of body from contact with rotating and moving parts of machine and equipment. The safe guarding eliminates the possibility of injury, persons working with it or working around the machine and equipment to contacting moving parts. The installation and foundation of the safe guards should be fixed. Make sure that, without authorized personnel no body should able to easily remove the safe guard. Or Make the healthy system, no body make any change at floor level without administration approvals. Safeguard is making safe human and machine that which parts are made covered to drop any object. As well as fall into moving parts that can damage machine and injure someone. The safe guard should be enough safe to not create new hazard. Generally we can see safe guard metal edges are much sharp and unfinished surface. The machine design should be friendly to manage any tasks like lubrication; maintenance man should be able to lubricate the machine without removing the top of safeguard. First, try to cover detailed information such as identification of hazards associated with operations and machine. Second, How the safeguard apply on the machine / equipment. How to install and maintain it. Third, How safeguard provides protection. 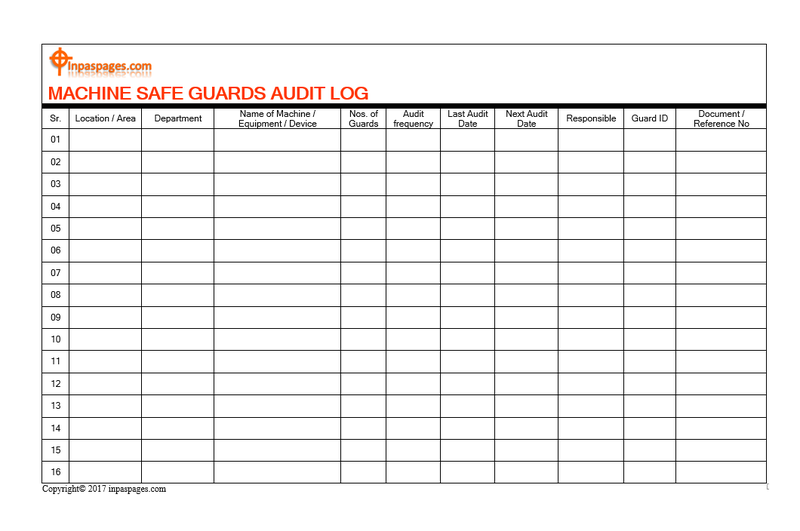 Forth, How to take care of safeguard during operations. For the new operators and maintenance new joins – setup safety training is necessary. So it’s important to provides and verify effectiveness of training. And same when new installation of machinery and operation deployed.